I have noticed that when the word zombie appears in the plot synopsis of a movie or television series, it can elicit very different expectations from those intrigued. Some immediately are looking for the horror and the gore, excited for the carnage and the more flesh that is ripped apart the better the experience. Some may prefer their Zack Snyder directed version of the wandering deceased, the sprinting dead, the blood thirsty track stars of tomorrow. Me, well I am one of those Romero enthusiasts, a traditionalist I guess you could say. A body count is less important to me than the thematic depth of the film, and a more methodical pace can work wonders rather than an onslaught of action. 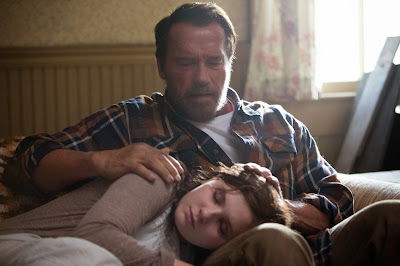 With this in mind, enter the brand new film from director Henry Hobson Maggie starring Arnold Schwarzenegger and Abigail Breslin, a very different take on the zombie sub-genre that is sure to disappoint those looking for Arnold to turn into the series 800 Terminator we all know and love, piling up corpses with his shotgun. No, this is a quiet and extremely morose film, one that suffers a bit because of its inability to escape a very one note tone throughout but it still works a lot more than it doesn't. 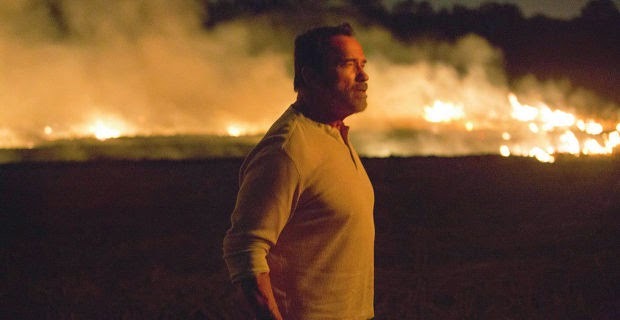 On a performance level Maggie shines as both Schwarzenegger and Breslin bring truly touching, tender work to the table as a father and daughter. Their bond is strong but is being tested by the heartbreaking turmoil caused by Maggie (Breslin) contracting the new virus that slowly but surely turns those afflicted into a zombie. As I said in the beginning, the word zombie brings with it expectations but in reality this story is essentially illustrating the pain a parent goes through when losing their child to a terminal illness. If you come to Maggie looking for a horror film, you are certain to be disappointed and I actually really admired the concept of a zombie transition that takes such a long time because I found it fascinating, that rather than watching it occur within minutes we witness it unfold slowly. Those bitten can live seemingly normal lives, eat meals with their family, hang out with their friends, but the dread of what is inevitable hangs over them during every encounter. The ability to say goodbye and shed tears with someone who is destined to become the walking dead is a haunting idea that is executed well here. The real, major flaw I find in Maggie is that while it does a whole lot really well, it doesn't really do enough to stand out and be memorable beyond performances. I will admit to initially laughing when I thought about taking Arnold seriously in an emotional role as a father going through such a struggle, but it didn't take long for me to believe in his pain. His turn here is shockingly nuanced and believable. Otherwise though, it's a well crafted and interesting film that lacks a real punch to make it stand out among a crowd.